We’re happy to help you with any of your questions. We’ve shared answers to many of the common questions below to help you get your answer quickly. Campion MyConnect is our app that allows you to read e-Books both online and offline and allows you to access interactive content when you’re online. You can store all your e-Books in your Campion MyConnect app, making it a single point for your digital resources. You can highlight, make notes and bookmark pages like you would in a normal printed textbook. Campion MyConnect works on desktops, laptops and tablets. It allows you to sync all your reading and work across each device you download it to. Watch our overview video here to learn how easy it is to place your order with Campion. How do I order digital resources such as Access Codes, eBooks etc? Ordering your digital resources such as access codes, eBooks etc is easy. Simply follow our instructions on how to order and when you get to your school’s resource list, simply look for the relevant digital items on your list. They will generally have something in the title to indicate they are a digital product, such as “Access Code” or “Interactive” or “MyConnect” or “eBook”. There will also be a statement saying “can only be ordered at www.campion.com.au”. This is a good indicator that it is a digital product. How do I find my school's book list or resource list? Click here. You will be taken to our ordering system where you can either decide to create an account with us or continue without creating an account. If you have your school’s 4 digit resource list code, you can then enter that in the screen as prompted, or you can search for your school by selecting your state, then by typing in your school name. All the lists for your school will appear and you can select your year level to see all your resources. If the status of your order still says ‘Submitted’, you can add, delete or swap items on your order (except for any digital products), or you can cancel your entire order (excluding digital products). If you have created a Campion Account, you will be able to log into your account and see your delivery timeframe listed in the ‘Delivery’ column for each order you’ve placed. You can also see the status of your order, to check if it has left our warehouse yet. Once your order has left our warehouse, we’ll email you the Australia Post tracking details so that you can check the progress of your delivery. You can also check your delivery timeframe on your confirmation email. We have partnered with Australia Post to deliver your order. Once your order has been dispatched from our warehouse, we’ll email you the Australia Post tracking details so you can check the progress of your delivery. You will need to collect your order from the location that your school has set. You can check these details by logging into your Campion Account or by checking your order confirmation email. What if no one is home when my order is delivered? If no one is at home when Australia Post deliver your order, they will leave you a card providing details on how and when you can collect your order from the site they are holding it at. If you know you are going to be away from home during the delivery period, we suggest that you consider providing an alternative delivery address when you are placing your order, such as your neighbours, grandparents etc (check with them first of course!). The date and location for your school collection are provided in your order confirmation email that you receive after you’ve placed your order. If you’ve created a Campion Account, you can log in and view the date of your school collection. Click on your name in the top right-hand corner, then select orders. Your orders will be displayed and you can view the collection date under the ‘Delivery’ column. You can ask a friend or a relative to collect your order on your behalf if you aren’t able to make it to the school collection day, and we find that this is a really good way of making sure you get your order when you need it. What digital eBook information will I receive after I have successfully ordered? Once you have submitted your order, you will receive an ‘Order Confirmation’ email which is your record of the items you have purchased. If you have correctly ordered your digital products, you will see them listed on your order confirmation. You will receive a separate email containing the unique access code for that individual digital product. You will generally receive this within 1 business day of placing your order. Your Order Confirmation email will tell you the approximate date that you will receive your access details for your MyConnect product. Your access details will be sent to you based on that date in a separate email. The timing of that separate email is determined by your school’s preference. Many schools decide to wait until the first week of school until they set their students up with their digital products. Generally this will be made clear in the emails we send you, but if you have any concerns you can always contact us. We are able to make exchanges and refunds on any goods that are deemed faulty from the manufacturer. Refunds may be provided on textbooks that are in their original condition, up to the 15th of February or two weeks after the purchase date, whichever is later. Please note that you’ll need to provide your original receipt or a printout of your online order invoice in order to make any returns or exchanges. Can I return or exchange digital resources? Unfortunately, if you change your mind, digital resources can’t be returned, refunded or exchanged – even if you haven’t used or activated them. Please order these items carefully, making sure you’ve selected the right resources for the right subjects. We rely on many different suppliers providing their resources to us. From time to time, some resources aren’t available when your order is being packed. If we haven’t been able to supply some items in your order, we’ll deliver them to your delivery address or to your school, free of charge, as soon as they are supplied to us. The invoice which you receive with your delivery will tell you which items weren’t available and will tell you where they will be delivered. If they are delivered to your school, you’ll receive an email letting you know once they’ve been delivered. Oversized items such as large art portfolios that cannot be posted will be distributed at your school at the beginning of Term 1. Unfortunately we aren’t able to advise on whether or not particular items are in stock in a particular store over the phone. We recommend that you place your order online and as soon as it comes in, we’ll have it delivered to you. If you happen to be in our store and the item you are seeking is out of stock, you can order and pay for it and our team will email you when it is ready for you to collect. What device should I use to download digital resources? Always use the device that your child will be using at school this year. It may be an iPad, tablet or computer, but if you’re not sure what device to use, it’s best to contact your school to find out which device they prefer you to use. When you receive an Access Code, each publisher has slightly different steps you need to follow to set up their resources. Many of the publishers need you to set up an account on their website in order to access the content. Password: You will need to create your own password. Each publisher will have their own criteria for password strength, but generally it will need to have at least eight (8) characters, contain one capital letter and one symbol or number. Keep these details somewhere safe so you can find them if you need them. If you have to set up more than one digital resource (ie on a different website for a different subject) use the same user name and password – it will make it easier to remember! **TIP FOR PARENTS: If you’re doing this for your children, make sure you’ve used their school email address (not your email address) and make sure they know what password you’ve created if you’ve created one for them. An Access Code is a unique code that gives you access to the digital resources you’ve bought. When you enter the access code, it indicates to the publisher that you have paid for the digital resources, and they will allow you to access or download them. You generally need an access code for each different digital resource you have purchased. This helps the publishers know which resources to give you access to. You can’t use the same access code for more than one person. In most circumstances, we will email you with the access code you need, but occasionally they will be provided on a small card with the rest of your books and stationery. What are the standard terms and conditions for digital resource licensing? The License Agreement is a legal agreement between you and Campion Education for the use of digital publications supplied by us for use in our purpose built readers, which includes electronic book material, and may include “online” or electronic documentation (“eText / eBook”). You agree to be bound by the terms of this licence by downloading your copy of this material. The eText / eBook is protected by Australian copyright laws and international copyright treaties, as well as other intellectual property laws and treaties. The eText / eBook is licensed, not sold. Under this licence, Campion Education grants you with a non-exclusive and non-transferable licence. You have access to install and use the eText / eBook on one device ONLY. This licence does not include the right to sub-license or distribute the eText / eBook to any other individual or entity. The Licence Term commences from the date of download of the eText / eBook and expires in 12 (Twelve) months, unless otherwise stated. • Not for Resale – The eText / eBook must not be resold, or otherwise transferred. • Rental – You must not rent or lease the eText / eBook. • Limitations on Reverse Engineering, Decompilation, and Disassembly – You must not reverse engineer, decompile, disassemble or remove any password protection used in the eText / eBook. • File Transfer – You must not allow copying of the eText / eBook including, but not limited to, copying through file sharing networks. • Marks of Ownership – You must not remove or alter any mark of ownership, copyright, trademark watermarks or other property right which is embodied in the eText / eBook including its documentation. • Copyright – All title, copyright and intellectual property rights in and to the eText / eBook, and any installation of the eText / eBook are owned by the relevant publisher and/or author. Storage of this intellectual property by any means electronic or otherwise, which is contrary to this licence agreement, may result in prosecution. • Termination – Without prejudice to any other rights, Campion Education may terminate this licence if you fail to comply with the terms and conditions of this licence. You must not export or otherwise transfer the eText / eBook from your country of residence, including, without limitation, to a country or jurisdiction whose laws allow or mandate loss of the title and intellectual property rights. This licence is governed by the laws of the State of Victoria, Australia. To the maximum extent permitted by applicable law, Campion Education’s entire liability and your exclusive remedy, shall be, at Campion Education’s discretion, either refund of the Licence Fee, if any applies, or repair or replacement of the eText / eBook that does not meet this warranty and that is returned to Campion Education. This warranty is void if failure of the eText / eBook has resulted from accident, abuse or misapplication. To the maximum extent permitted by applicable law, Campion Education disclaims all other warranties and conditions, either express or implied, including, but not limited to, implied warranties or conditions of merchantability, fitness for a particular purpose, title and non-infringement, with regard to the eText / eBook. This warranty gives you specific legal rights. You may nevertheless have the benefit of certain rights or remedies pursuant to consumer protection acts and laws. This warranty does not preclude such rights. To the maximum extent permitted by the applicable law, in no event shall Campion Education be liable for any special, incidental, indirect, or consequential damages whatsoever (including, without limitation, damages for the loss of Profits, Interruption, loss of Information, or any other Pecuniary Loss) arising out of the use of or inability to use the eText / eBook even if Campion Education has been advised of the possibility of such damages. In any case, Campion Education total liability under any provision of this eText / eBook shall be limited to the amount of the Licence Fee, if any. I've lost my access code emails - how do I resend them? Can’t find the email that had your access codes and instructions? Don’t worry, if you created an account when you ordered your products you can simply log in, find the order for your child and click the ‘Resend eBook emails’ link. All the access codes will then be sent to both your email and the student’s email address that you provided. Watch this video to see how easy it is. Cambridge have introduced a new tool called Cambridge Code Health Check to help you make sure your unique 16 character access code is valid. Visit www.cambridge.edu.au/codecheck and enter your 16 character access code to confirm that the code in your textbook is valid. Cambridge have provided a support video for all resources that use their Cambridge GO website. This video will step you through how to set up the digital resources that you need to access from the Cambridge Senior Maths website. Open the email you received which containing the details of the product you have ordered, containing your unique Access Code and instructions on how to use the Access Code to access your eText. If you are an existing user, sign in with your existing details. If you have forgotten your password, click ‘Forgot your password?’ to have it reset. If you are a new user, you will need to create a new account by clicking on the JOIN NOW button shown to the right. Enter your details as prompted and create a username and password to set up your account. We recommend you use your student school email address as your User Name. You will be asked to enter the Access Code provided in the email from Campion to activate your eText. Cambridge now confirms your access code has been accepted with a welcome page. Complete the details requested. If your teacher has already provided a class key enter this now. If not, enter it later via the account settings page when your teacher provides it when school returns in 2017. This video will step you through how to set up the digital resources that you need to access from the Cambridge Essential Maths 2nd edition website. You will need to create a new account by clicking on the JOIN NOW button in the top right-hand corner of the website. Enter your details as prompted to create a username and password to set up your account. Use your student school email address as your User Name. Complete all details in all fields. At the end you will be asked to enter the Access Code provided in the email from Campion to activate your eText. Watch this video to learn how to use your Cambridge reactivation codes for your secondhand Essential Maths or Senior Maths textbooks. Enter your details as requested and enter the activation code located on the inside cover of your secondhand book. On the next screen, enter your state and your postcode and click continue (if you’ve been provided with a class key you can enter it but it’s not required). Your interactive text will be displayed. If your previous product has expired, you will have the option to activate your new product as soon as you log in. Please be careful when purchasing secondhand textbooks – if you’ve purchased the wrong edition the reactivation codes may not work. Please refer carefully to your schools resource list for guidance. If the activation code inside your secondhand textbook is faulty or cannot be read, please contact enquiries@cambridge.edu.au. This video will step you through how to set up the digital resources that you need to access from the Jacaranda website. If you have an existing account (i.e. you have used Jacaranda Plus in the past) you can login with your existing email and password at the top right and jump to step 4 below. If you are a new user, to create a new account click Create Account and complete your details as requested. We recommend using your school student email address as your user name, or if you don’t have one, use an email address you access regularly. When you complete the registration form a thank you message will be displayed. Confirm your details and select confirm & proceed to be taken to your Jacaranda bookshelf. Select ‘Add a new title’. You will be prompted to enter your registration code. Use the Access Code in your email from Campion. Click ‘Add’ and you will be taken to a page that asks you to accept Jacaranda’s terms and conditions. After accepting the terms and conditions you will be taken back to your Jacaranda bookshelf and the eText you have activated will now be displayed. This video will step you through how to set up the digital resources that you need to access from the new Macmillan Education Everywhere website. Enter the Access Code provided in your email from Campion, then click ‘Check Code’. Enter the details in the boxes as prompted. Enter the student’s first name and surname as the User Name and create a password they’ll be able to remember. They’ll need this information when they need to access the resources at school. When you have entered all the information, click ‘Activate’ to continue. The digital resource will be displayed on the next screen, and can be accessed by clicking on it. The student will need to log in from the right hand side of the screen when they return to school. They’ll just need to enter the User Name and password you created for them and then click ‘Log In’. Their text will then be displayed for them, and can be accessed by clicking on it. This video will step you through how to set up the digital resources that you need to access from the Macmillan One Stop Digital website. Existing and new users should both click on ‘Create an account and register an access code’. You will be asked to enter the Access Code provided in your email from Campion Education. Next, enter the security code and click ‘Continue’. If you are a new user follow the link next to “Don’t have an account?” in order to create your Macmillan account. Click continue and confirm the eText you are accessing. Within an hour your Macmillan product will be available within your My Subscriptions tab. This video will step you through how to set up the digital resources that you need to access from the NelsonNet website. You will come to the Nelsonnet login page. If you have an existing account (i.e. you have used NelsonNet in the past), enter your details to log in to your bookshelf and jump to step 4 below. If you have forgotten your details, click the box ‘Forgotten your details’ to have them reset. If you are a new user, create a new account by clicking create a new student account. Enter in your details as prompted. We recommend you use your student school email address to set up your new account. If you don’t have one, use an email address you use regularly. You will then be taken to your NelsonNet bookshelf. In your bookshelf, find the Add a title to your bookshelf field. Enter the Access Code provided in your email from Campion. Then click ‘Add Title’ to add your new eText. Your new eText has been successfully added to your bookshelf! You can view this eText by clicking Read NelsonNetBook. This video will step you through how to set up the digital resources that you need to access from the Oxford website. If you have an existing account you can simply sign in and jump to step 4. If not, you will need to create a new account by selecting ‘Register’. Enter the information requested. We recommend you use your student school email address or if you don’t have one, use an email address you regularly access. You will then receive an email from Oxford which will prompt you through activating your account. Select ‘Activate’ within the email from Oxford and return to the Oxford website and login to your new account. Once logged in, your Oxford digital library will be displayed. Click ‘Add new’ and enter your Access Code provided in the email from Campion in the box as requested. You will now get verification that you code has been accepted and activated. Your eText will now be displayed in your Oxford Digital library. This video will step you through how to set up the digital resources that you need to access from the Pearson Places website. If you have an existing account (i.e. you have used Pearson Places in the past), login under the “Existing Users” section and jump to step 4. If you are a new user, create a new account by selecting New Users. Enter your details as prompted. Click the checkbox indicating you have read and understood the Privacy Collection Statement. We recommend you use your student school email address as your User Name or if you don’t have one, use an email address you regularly access. You will be taken to your Pearson Places home page. Enter the Access Code provided in the email from Campion into the ‘Activation code’ boxes. Enter the security code number as displayed in the coloured box on the Pearson Places web page, then click Submit. After clicking Submit, you will be asked to confirm your access code again and enter an additional security code. Enter your access code again and click Submit. Confirm your eText and enter in the student’s Year Level and School. Your new eText has now been successfully activated and is available in your Pearson Places Passport. How do I download the Campion MyConnect app? To get started, make sure you are connected to a WiFi or school network that has an active internet connection. 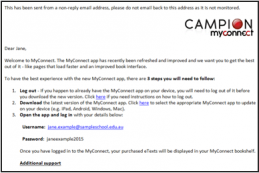 If you’ve ordered a Campion MyConnect product, open your Campion MyConnect confirmation email on the device that you want to download Campion MyConnect onto. Then follow the links to the download page. Watch our overview video to learn how to download and log in to Campion MyConnect. Click on the Windows download button to the right to download the MyConnect app for Windows. The minimum recommended device is an i3 processor with 4GB of memory, 10GB of free disk, and a screen resolution of 1280 x 1024 running on Windows7 or above. Please note that the use of iPhones is not recommended with this app. The Campion MyConnect app is free. OR Click here to download the myConnect App (.dmg install) if you don’t have an Apple ID. NOTE: We recommend downloading the MyConnect app via the App store. If you use this .dmg file please understand that you will not receive future updates or bug fixes etc. The minimum recommended device is an i5 processor with 4GB of memory, and 200GB of free disk, running on Apple Mac 10.9 (Maverick). The minimum recommended device is a Galaxy Tablet 10″ running on Android OS 4.4 (Kit Kat). Please note MyConnect will only work on tablets that have a screen that is 10 inches or more. When you are downloading you may be prompted to enter your Google GMail ID and password, like you would for any other app. The Campion MyConnect app is free. How do I log in to Campion MyConnect? Open your Campion MyConnect access email. You’ll need the User Name and Password details to log in. Once you’ve downloaded the MyConnect app, open it on your device. You will be presented with this screen. Enter the User Name and Password that were provided in your Campion MyConnect access email in the fields as required. How do you use the Campion MyConnect app? This video provides an overview of the features in your Campion MyConnect library and explains how to use them. This video shows you how to navigate and use the reading features when you’re reading your eBooks in the Campion MyConnect app. Here we show you how to bookmark a page that you want to come back to later and how to make drawings within an eBook. This video shows you how to highlight sections of text in an eBook within Campion MyConnect. Here we show you how to add notes to a section of text or page in an eBook in Campion MyConnect. Please fill out your details and we will be in touch with you.